Celebrating my birthday this past weekend was seriously perfection. Typically, I’m not one to make a big deal about my birthday, but for some reason, this year was different. I was really looking forward to it and being able to spend it with my absolute favorite people was icing on the cake! I’m not one for a lot of fanfare or fuss and that’s just how I wanted my birthday weekend to be: low key, fun, and relaxing. So, that’s what we did! Saturday was spent with Cory. He cooked me breakfast and we enjoyed a slow, relaxing morning before heading out in an attempt to remove the rubber from an 18-wheeler tire rim. It was something we were sure would take mayyyybe half an hour, tops. Well, that’s definitely not how it went down. FOUR HOURS later, we finally had a fire ring! Holy smokes was it hot and exhausting. It wasn’t exactly how I pictured spending the day, but Cory and I stayed laughing (for the most part) through it all and it got done. Only to discover the county was recently put under a burn ban. Fail. Epic fail. BUT, we have a ring ready to go if and when the ban is lifted :). That night, we headed out for the pumpkin patch! I had never been before, so I was itching to go. 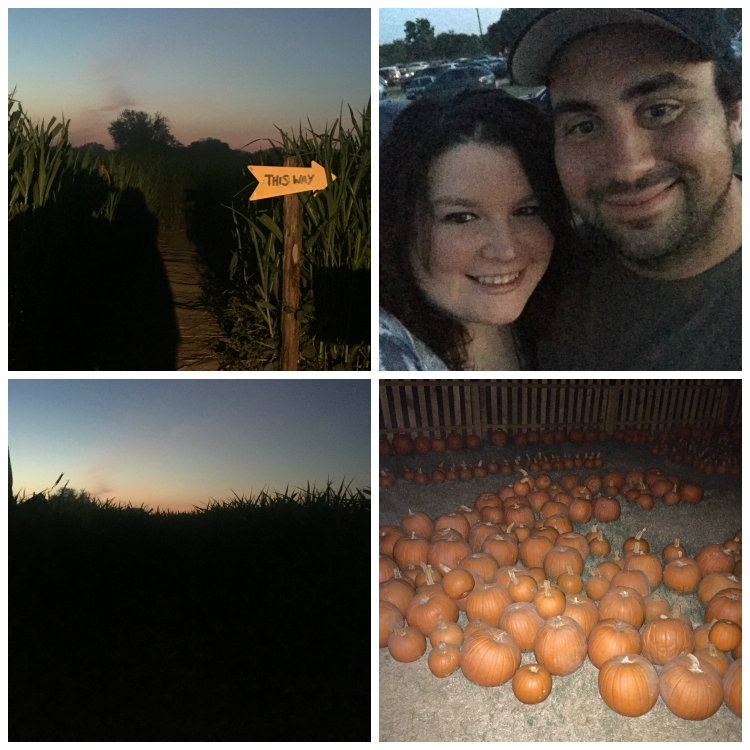 And honestly, the one we went to was a tad disappointing in the pumpkin department, but the corn maze was a blast! It was dark when we went through it so it made for some entertainment, survivor-style! And I learned that Cory is a very, very good leader! We worked through the maze and only got lost once or twice. Seriously though, it was so fun! The next morning, we woke up super early to get to my parents’ house by 7am. It was LAKE DAY! My request for my birthday this year was to go to the lake and spend it on the water with my family. And it was amazing. Looks like you had a blast! Happy belated girl! Happy belated Birthday! What an awesome way to spend your birthday pumpkin patches and lake days are my jam, I am so jealous of your awesome weekend!